Say you’ve invested in a new, greener car—an electric, a hybrid, or a particularly fuel-efficient version. What choices do you have if that car is in a fender bender? Are there eco-friendly options for fixing it? With winter and icy roads in our near future, it’s a good time to consider the issue—no matter what kind of car you drive. Below are some environmental tips for what to look for in an auto body shop if your car needs repairs. Auto body shops are known for handling some pretty nasty chemicals. In fact, the Minnesota Technical Assistance Program (MNTAP) identifies the industry as among the top 10 sources of hazardous air pollutants in Minnesota. If you’ve ever walked by an auto body shop and caught a whiff of fumes, that’s VOCs—volatile organic compounds. VOCs and hazardous air pollutants are from body shop painting and cleaning operations and are harmful to human health and the environment. In the air, VOCs turn into smog-producing ozone, which pollutes and can make us sick. Reducing VOCs benefits everyone--customers, employees, the community, and the environment. Look for shops that use water-based paints and low-VOC solvents. Let your nose be your guide—you’ll be able to smell the difference if you stop in for an estimate. If you’re calling around for estimates, ask the shop ahead of time what type of paint and cleaners they use (water-based or solvent-based). 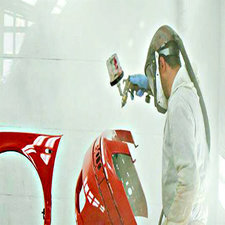 The use of water-based paint can reduce emissions by ½ or more. In addition, shops using water-based paints often have a more energy-efficient paint booth and more efficient equipment for applying paint, which reduces material waste and energy. What is the shop doing to reduce energy use? Examples include more efficient lighting, such as LEDs, and increased daylighting through skylights, windows or solar tubes. What other eco-friendly projects has the shop undertaken? A growing number of shops identify their green initiatives and efforts on their websites. Does the shop use recycled car parts? 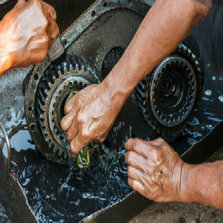 Car parts require a lot of energy and resources to produce. The use of recycled parts helps reduce these demands. Look for shops that have gone the extra mile—examples might be installing solar panels, establishing a rain garden or using rain barrels, or offering hybrids or other fuel efficient vehicles as loaners. Several auto body shops have received MPCA grants to switch to cleaner, less polluting technologies and materials. Read more about these businesses and their green accomplishments here. For a listing of auto body shops that have switched to water-based paints with the help of grants from the City of Minneapolis, click here. Water-based paint makes every color green. Latuff Brothers Auto Body in St. Paul was the first auto body shop in the Midwest to install and use water-borne finishes to repair vehicles. Saturday, November 19th, 10AM-5PM. Midtown Global Market, 920 East Lake Street, Minneapolis. Kick off the holiday season with Do It Green! Minnesota’s 11th Annual Green Gifts Fair on Saturday, November 19th, 10am-5pm at Midtown Global Market in Minneapolis. Sara Hayden Shaw had always wanted a special work space for her central Minnesota home. When she installed a solar air heat (SAH) system to heat space in her detached garage, her wish was granted. The cost of the single 8’ x 4’ panel SAH system was about the same cost as running a natural gas line and installing a small gas heater, $4,000. But thanks to the 30 percent federal tax credit and the Made in Minnesota Solar Thermal Rebate, she reduced the cost of her system to $1,987, with the tax credit paying for $1,325 and the solar thermal rebate accounting for $1,104. Read the CERTs story by Shaw. Rebate opportunities for solar thermal systems remain available to all Minnesota residents, businesses, nonprofits, and government entities as part of the 2016 Made in Minnesota (MiM) Solar Energy Incentive Program. Source: Minnesota Department of Commerce Renewable News, October 2016.